It has been a while since Google shut down Google Reader. Many bloggers looked for alternatives to readers so that they could distribute their content to their audience. One of the ways that has remained most effective is the email newsletter. Emails reach the users right where they are: their inboxes. Email also gets checked at least 3-4 times a day across all devices. But then, creating and sending an email every time there’s a blog update can be time consuming. Take this case: You’re a small business owner and you use your product blog to communicate about the latest updates and industry trends. You make sure that you write at least 2 articles every week. Once the posts are published, you monitor them for reactions from your audience. There’s one more step that you take to maximize reach; you email a copy of the blog post as a newsletter to your customers. This is where RSS Feed Campaigns can save you some time, and your blog posts are automatically delivered to your subscribers. You can create this RSS campaign in Zoho Campaigns from the Advanced Campaigns section. All you need is the feed URL of your website. You can then set the frequency and time, and you’re all set to go. You do not have to create 2 types of content – one for your blog and the other for your newsletter. 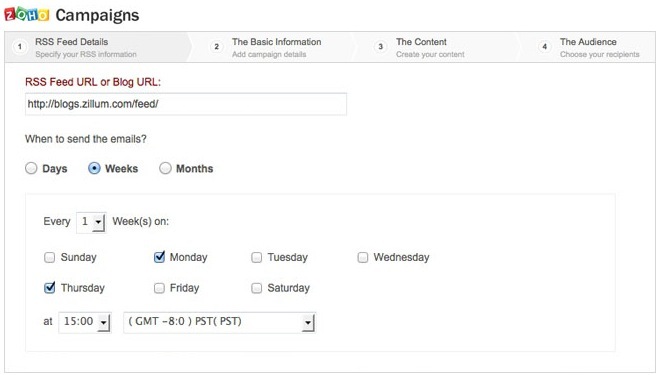 RSS campaigns automatically take the updates from the feed URL that you have specified. You’re then left with a lot of time to focus on other work. Your audience do not have to use feed readers to discover your content. Your blog posts are automatically delivered as an email. Your subscribers can choose to receive updates from you in the form of sign-up forms in your website. They enter their email addresses which land in your mailing list, and you send automatic updates to only these people. Your subscribers can also choose to unsubscribe from your lists right from the email newsletter. Setting up the RSS email campaign is a one-time activity and your blog content will be delivered automatically. You just have to focus on the content of your blog. Zoho Campaigns also gives you RSS email templates that you can choose from. You do not need web design skills to set up a feed campaign. No, RSS campaigns do not give you feedback on your content, but reports from these email campaigns tell you the reaction from your subscribers. Zoho Campaigns has reports for every feed campaign that you set up. You can measure, compare and make changes to your content accordingly. Your email newsletter goes out even if you do not have enough content for a full-fledged newsletter. You are in constant touch with your subscribers. View the page source of your blog. Search for the term ‘RSS’. If you find this link in the <Head> tag, bingo! You’re good to go. If not, there’s nothing to worry. There are plenty of feed generators out there that can generate the URL for you. We have an online guide that gives you all the details about RSS campaigns from Zoho Campaigns. Let’s know your thoughts in comments below.